Barrel: 3.5 inches, smooth bore. Ammunition Type: Steel BB's 4.5mm. FPS: 400 fps/ 122 m/s. 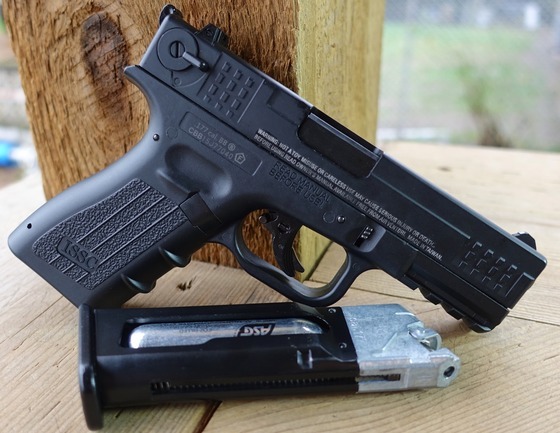 Trigger Pull: The trigger pull on the Air Venturi ISSC M22 CO2 Blowback BB Pistol is pretty decent overall. 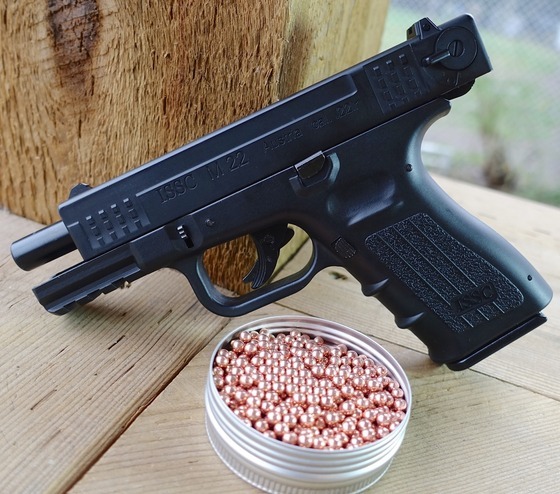 Unlike the original 22LR ISSC M22 that is single action only, the BB version shoots on both single and double action. 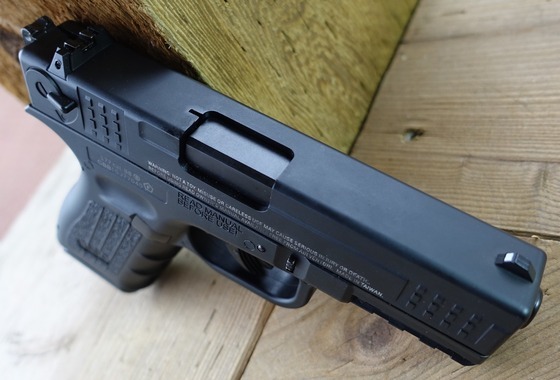 When shooting in double action, the trigger pull is a little bit heavier since the hammer is not pre-cocked but shooting in single action does require full trigger pull length since the first stage of the trigger pull chambers a BB into the breach area. The second stage when shooting in single action releases the hammer. Accuracy: I have only shot the Air Venturi ISSC M22 CO2 Blowback BB Pistol briefly, and only using a free standing position shooting at some pop cans. I did notice the Air Venturi ISSC M22 CO2 Blowback BB Pistol shot a little bit low at 20 feet but was well centered side to side. The BB's seemed to travel pretty quick and the blowback action was snappy and allowed for some pretty decent rapid fire action. I will be following up this table top review with a field test shooting video down the road. 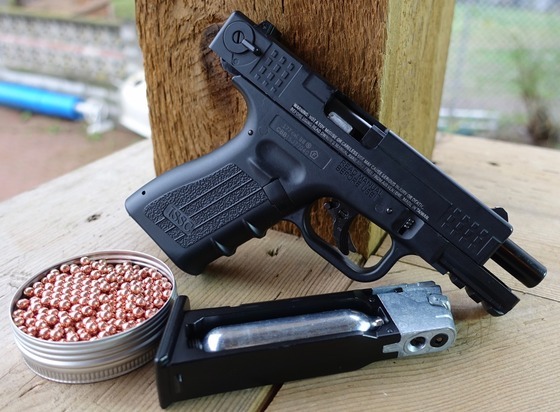 Build Quality: I was impressed with this pistol right out of the box, being an owner of the real steel 22LR version, I was actually rather surprised at how accurate of a reproduction in terms of build quality the Air Venturi ISSC M22 CO2 Blowback BB Pistol was. 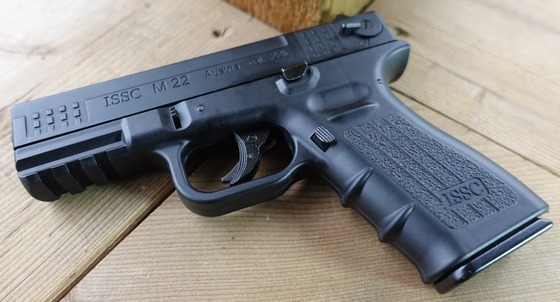 The BB ISSC M22 has a good weight and feel to it and metal and plastic parts in pretty much all the same places you would find them in the 22LR shooting version. The plastic frame feels solid and well made while the metal slide has very close tolerances and the black satin finish looks good and seems to be wearing pretty well. 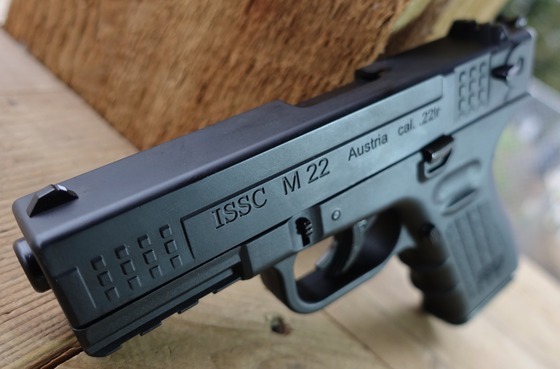 Really great overall replace of the 22LR ISSC M22. Metal and plastic parts in all the same places as the 22LR ISSC M22. Full blowback operation with single action trigger. Adjustable rear sigh for windage. 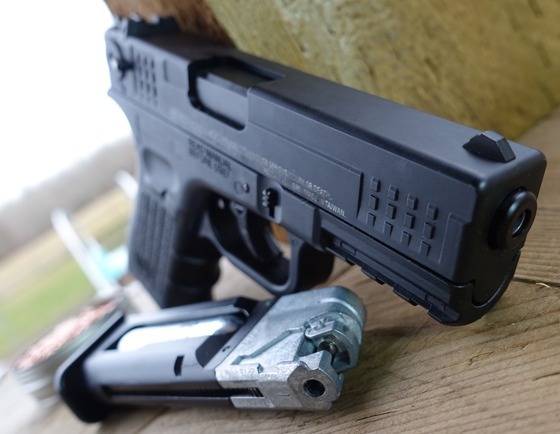 One of the closest 4.5mm Steel BB pistols to a Glock that we have available to us. Does not seem to field strip at least easily. Slide safety is module into slide and none functioning. 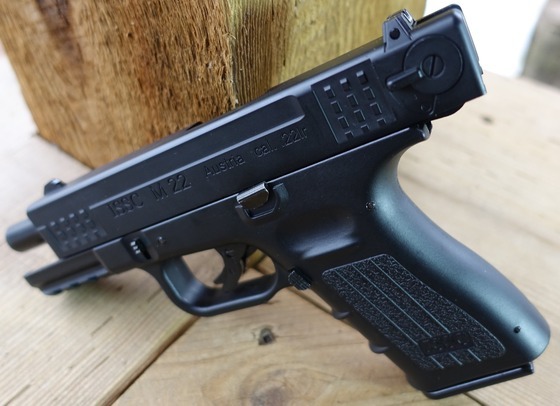 All in all this may just be my new favorite blowback BB pistol, I obviously like the design since I already own the 22LR version and it does look a lot like a Glock so that may be a benefit to you Glock lovers out there. The Air Venturi ISSC M22 CO2 Blowback BB Pistol really does seem to have a lot going for it... Blowback operation, a full size drop out metal magazine that holds the CO2 and BB's, decent fps and accuracy, an adjustable rear sight, working parts where they are supposed to work on the real steel version and that Glock look and feel but without the worries of Glock coming after you for violations of their copywrite since this is a licensed ISSC M22 replica.